Middle class families, like their upper-class peers, took the interior of their houses very seriously. It was the primary means with which they could put their financial and social status on display for the world to see. As such, interior design was arguably the quickest developing part of the house which continually morphed into different styles. Naturally trends in decoration still did occur. Public rooms in the house were always by far the most stylish and highly decorated. One of the sure signs of a room’s public intention is the ceiling rose. This was an ornate decorative piece which was attached to the ceiling in the centre of the room. They usually contained floral patterns, although they were normally painted to match the ceiling.40 The primary light — a gas lamp at the beginning of the Fin-de-Siècle, but quite often powered by electricity by the Edwardian period — hung down from the centre of the ceiling rose. Another sign of a public room was its cornices. Also called covings, these trim pieces decorated the upper corners of the room where the walls met the ceiling. In upper-middle class homes, these could be very ornately carved pieces with patterns such as leaves.41 The ceiling rose and the cornice were only a couple of many holdovers from the High Victorian period. 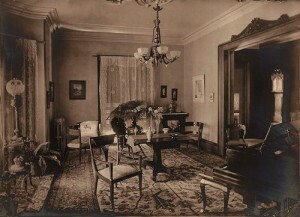 Private rooms were more often fairly simplistic and lacked many of the decorative features of the public rooms. A common feature shared among all rooms, however, was the fireplace. Located along one wall or, in many Edwardian houses, in a corner of the room, the fireplace was arguably one of the most important aspects of any room. Furniture was usually placed in the vicinity of the fireplace which was practical for Britain’s long winters. It became a symbol of sociability and family unity. Whilst these were also Victorian values which had been inherited, they remained very important throughout the Fin-de-Siècle as well. Decorative pieces made out of wood were attached to the wall immediately surrounding the fireplace and together were called the chimneypiece.42 As with other aspects of a room, chimneypieces were highly ornate in public rooms, often containing carved floral designs or simple patterns. They remained more practical in private rooms with less carvings. The mantelpiece, located directly above the fireplace, served as a shelf on which to set a clock and knick-knacks for prominent display. Like their Victorian predecessors, fireplaces also had an overmantel which usually consisted of nothing but a mirror to give the room a larger appearance. Unlike in the Victorian era, however, it generally did not matter how large and fancy the mirror was as far less importance was placed on it. This was due to the fact that plate glass had become cheap enough that even the poorest of the middle class could afford large mirrors.43 Another piece of decoration which became more affordable during the Fin-de-Siècle was wallpaper. In Late Victorian and Edwardian houses, walls were primarily covered in wallpaper and relief paper rather than painted. This was true of the houses belonging to the upper-middle class as early as the High Victorian era, but by the Fin-de-Siècle, wallpaper had become cheap enough that the lower-middle class could also afford it. Cheaply produced rolls of wallpaper printed in factories had become available mid-century and were very fashionable by the end of the century.44 These were simpler in design and used much lighter colours than before as both were easier to print. Relief paper was also popular and was generally used to cover the dadoes — the lower part of the wall where a wainscot would be located. This type of paper had three-dimensional patterns which were pressed into the paper to make them pop out. Other innovations in materials also allowed for other parts of the house to be more decorative than before. Flooring is a prime example of something which became more elaborate during the Fin-de-Siècle. The rising popularity of a new material called linoleum allowed the middle class to have ornate patterns covering their floors.45 Linoleum could be cheaply mass produced and could be made with a very large variety of designs which is how it gained such popularity. An advertisement for it from the early twentieth century shows several, very different designs and boasts of the ‘ever increasing popularity’ whilst claiming that the company has ‘an enormous stock suitable for Halls, Offices, Libraries, Books, Yachts, Churches, Bedrooms, and Nurseries’.46 Cheaper building materials, however, were just a single type of innovation of the Late Victorian and Edwardian periods. 40 Long, The Edwardian House, p. 133. 42 Yorke, The Edwardian House Explained, p. 69. 45 Long, The Edwardian House, p. 153. The full bibliography is located on the Houses in Fin-de-Siècle Britain project page. This entry was written by Alex Seifert, posted on April 3, 2016 at 8:51 pm, filed under 19th Century, 20th Century, Architecture and Buildings, British History, Featured, Houses, Houses in Fin-de-Siècle Britain, Multi-Part Series and tagged Architecture, Britain, Fin de Siecle, Houses. Bookmark the permalink. Follow any comments here with the RSS feed for this post. Post a comment or leave a trackback: Trackback URL.